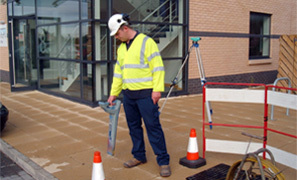 Do you or your team need to know more about BSI PAS 128 Specification for utility detection, verification and location , Utility Detection and Mapping Surveys or any other survey processes? Malcolm Hughes Land Surveyors regularly host webinars, training sessions and client technical awareness presentations. Depending on numbers, availability and location we will tailor a session to your own company/organisation’s needs. Please get in touch with us at surveythis@mhls.co.uk with your details to organise a session that fits your needs. This website is independent of British Standards Institution (BSI) and the Institution of Civil Engineers (ICE). However, Malcolm Hughes Land Surveyors - in particular managing director, John Robinson - has played an integral role in the conception of PAS 128. Malcolm Hughes Land Surveyors is a project sponsor and on the PAS 128 Steering Group. John was also one of four industry specialists on the drafting panel who wrote the specification and collated industry wide comments in order to produce this important document. We truly believe that constructive dialog between client and practitioner can only increase the understanding of the subject matter, improve relations and facilitate a long term relationship based on mutual understanding.